This is my second post on Sycra Forums. I've been learning some digital painting, and made one from photos of places I visited. I would be happy to receive critics, suggestions and know positives about my painting as well. 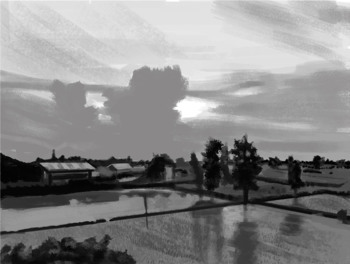 The following is a painting I had done on my visit to a rural city called Shahjehanpur, in UP, India. One of them I did in gray scale. I hope I have captured its essence. Plase let me know if I need to add reference (original) Images. I think you can play a bit with the Auto-Contrast feature to check if values can be made clearer. Here I think this improved the result. Also the bright patches in the first picture look a bit alien, I believe you wanted to make some bright patches that contrast with the tree shadows, and I tried here with a slight gradient to make that clearer. I had the idea of using Auto_tone. I even tried it, but was hesitant to apply the same while painting. You see, I wanted to paint as much correct values as I could by myself, because they're recurring problem in most of paintings. But i'm moving closer. Now I've applied both Auto-contrast and Auto-Tone. Looks much better. BTW, Why do the bright patches look alien? Please explain a bit more clearly. And I can see you've faded that area. Did you just apply a dark brush stroke? I'm just curious to know about that. Also, please have a look at the updated one. I think the grayscale is fine as is. The issue with the color one is the saturation. It is way too much due to the choice of color and putting them close to black or near black. I think this is a matter of practicing restraint. Dark doesn't always equal black and intense colors are made intense by what is around them. The auto adjust commands will not help in any way to fix this issue (in fact it will make it worse) and the results are negligible or even detrimental to the grayscale painting. Audiazif wrote: I think the grayscale is fine as is. The issue with the color one is the saturation. It is way too much due to the choice of color and putting them close to black or near black. I think this is a matter of practicing restraint. Dark doesn't always equal black and intense colors are made intense by what is around them. The auto adjust commands will not help in any way to fix this issue (in fact it will make it worse) and the results are negligible or even detrimental to the grayscale painting. Thanks a lot Audiazif. I myself feel this was too saturated. I was trying to make it look more close to the photo. But after I finished this, I realized I should have gone with more variation of colors. BTW I haven't used any black, that's just a very Dark shade of green, and its true that there is No true black in nature where there is light source. We can observe that while painting from life. The attached image is the first version of the painting. I hope this is what you were talking about. I would love to get further insight about that..
Another question. Is most of these problems because of painting from a photo? Because this one I took from my phone's 13 mp camera and not a digital one. Not all camera lenses / Softwares can capture/render good colors. I have also practiced painting from life using water colors. (See attached) I know I haven't practiced much, and its not that great but would love to have opinion about the same for improvement. Thanks for the complement for Grayscale painting. P.S. Sorry for the curved water color page that's skewing the painting around edges. Audiazif explained why the color patches looks alien, mostly due to being too saturated. I don't mean to use auto-contrast as part of your initial creation, but as a check tool once you're finished, to see if altered values turn out better than yours. Thanks for posting the reference picture. 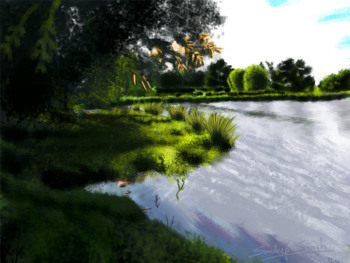 To me the river bushes look flatter on your painting, maybe because the texture looks more like moss than leaves to me. Cameras in general are bad to capture colors accurately. In "Color and Light" by James Gurney, there's a section "Photos vs Observation" where this is detailed. A suggested compromise is doing a quick color sketch on site and complement it by black and white pictures for the details. Knowledge of photography and photography equipment (reflectors...) can also help in capturing the colors. Yes, that explains a lot. Thanks for the references, James Gurney is a GREAT artist. I will keep all these things in mind. Looks like I have a lot to improve. One more thing I wanted to ask: While painting digitally, does it matter if we have NVidia card or not. Because my system only has inbuilt Intel graphics and I have noticed that the paintings render differently on my smartphone than it does on my PC screen. My monitor quality is also not that good. What settings can I use to get the best out of it? If I have to buy (sometime later) a Graphics Card, New Monitor, etc. which one do you recommend for Digital Painting? I don't believe the graphic card changes anything when doing digital painting. More likely your computer screen and smartphone screen display the color a bit differently. I don't really have a recommendation for screens. If you plan to work with a professional printer you may need a screen you can calibrate. bosinpai wrote: I don't believe the graphic card changes anything when doing digital painting. I have made some quick color changes. Here is an updated version of my painting. I have used total 4 to 5 tones. Do the color look more harmonious now? Is the highlight on the right side grass and the trees still very saturated, bright? BTW, I noticed the auto tone/adjust made the Dark values as truly BLACK when I applied it in previous versions. Please give some opinion on the new Image. - Positive: You are going out there and paint ! Do it more...it will get better! - i know this myself - you are out there, and its great...you feel great and when you look at the photo at home its kind of boring. - so ask yourself WHAT is it, you find exciting at the thing you want to paint. Shapes? colors? Mood? Story? - avoid "green" green. Use yellow/green for the lighter parts and blue/green for the darker parts or even a dark brown. - painting traditionally is great - do more! - i highly recommend using toned paper, two markers (dark like value 7 or 8 and a middle one, 4/5) and white and a pen. Then go out there and try to catch some basic value comps. - so you get more bold in blocking in some darks and general values before meddling with color. So hope that helps and gives some ideas for your next try....happy painting! Thanks a ton for such an awesome advice bro. I will absorb Every bit of it. -And your painting looks delicious (Lively). Cool and soothing colors. Good mood. -Don't mind about the reference, I know how bad it is. It was afternoon and my camera does not capture colors correctly. Will try to do live painting as much as possible and follow your advice on editing while I'm painting digitally. -I like how you organized your thumbs and references. -Could you please elaborate on this: "two markers (dark like value 7 or 8 and a middle one, 4/5) and white and a pen". I know about toned paper, I will buy that. What are these markers called? and which pen type/color to use? sketching and painting. Feel free to just use whatever medium you feel confident!